Well, finding your 'hand shape profile' ... should become quite easy now with the new picture below! Looks like I have described all possible combinations in my new picture (see previous post). And it appears to be a sensible system for recognizing 'mixed' hand shapes! ... Looks fabulous. Tomorrow I will be able to finish my model by adding a few more codes + I will add the 'mix' zones in the picture with the elemental axes. The ++ | ++ | + code will move the earth category and the -- | -- | - to water category. For mine, wait until I update with measurements based on the criteria you've presented. I have tried to measure my hands several times in different ways since and each time I get slightly different results. This is by using a ruler across my palm in a couple of attempts. Another was to mark ink pen spots at the different points on my hand and press quickly and firmly on paper to leave the wet ink there and then measure those dots. and tonight I printed out copies direct from the scanner and measured those and have another set of figures! I can only recommend to use a stable measurement tool. I assume that you are struggling with the palm breadth measurment only? PS. 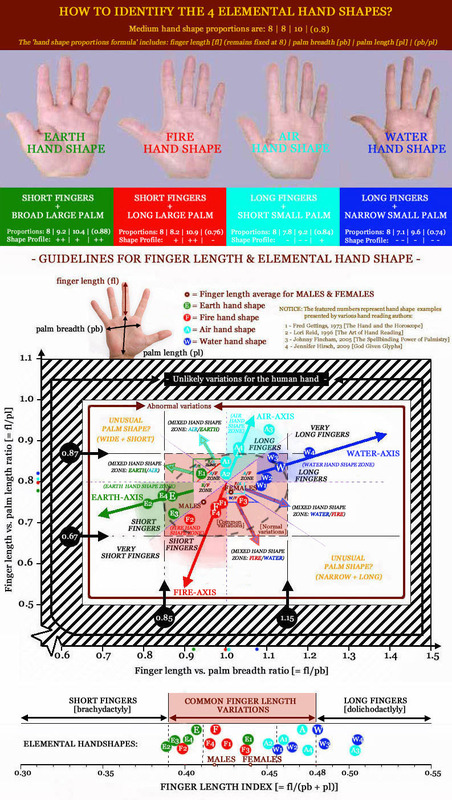 Chances are not very high that a (small) measurement difference will result in a different palm shape result. In my opinion, there is not any way to measure the hand to the tenth of a centimeter, at different times, and have consistent measurements. The slightest change in hand placement, angle of viewing and the body conditions at the time will change it. Patti, the most accurate way I have found is to lay your hand down flat on a piece of white paper and use a clear ruler. (The only problem is if you have long finger nails that block the contrast between the paper and the end of your finger). tap wrote: In my opinion, there is not any way to measure the hand to the tenth of a centimeter, at different times, and have consistent measurements. The slightest change in hand placement, angle of viewing and the body conditions at the time will change it. I have mentioned that measuring hand dimensions is not an 'exact science'. So, if you have problems finding a representive measurement, the I would recommend to make a few measurements (carefully), and then you can use the average. By the way, regarding the 2 measurements that you shared so far... those resulted in the same hand shape (according the 'shape formula'). PS. Regarding the measurements, I try to do my measurements as accurate up to 0.5 mm, this avoids that you have to choose between a rounded number of mm's. Also, I am using a 'shine-through' ruler (like the one illustrated below)... which makes it probably a bit easier to find accurate (representative) measures. Thanks for the suggestions Tap and Martijn. The width isn't difficult to measure. Mostly it's the length of the middle finger. I do wear my nails a little long, so the very tips of my fingers have a peak. With the nail in the way it's difficult to mark exactly where it ends on the paper below. Then while my hand is still pressed down, it's difficult to see where the finger meets the palm. I'll try with another photocopier this afternoon. I think I got it all figured out! Thanks!!!!!!!!! working on this chart really made sense!!!!!!!!!! Where is the fire icon? PS. Yes Tap, FIRE is the dominant element for your hand shape (especially for your right hand; for your left hand my figures point out that you are on the borderline between 2 'mix' hand shapes where FIRE is involved). I will specify the details later. Patti I never tried measuring with a photo copy. Seems your measurements changed your hand shape profile. Thanks Martijn ! Really looking forward to when you have the hand shape chart complete! PB/PL = .75 -- ? Or depending on measurement accuracy am I just + / ++ / - ? I still I am not getting the middle area of the chart. Also is there no zone for earth/fire mix and air/water mix hand shape? tap wrote: Patti I never tried measuring with a photo copy. Seems your measurements changed your hand shape profile. I think these are probably the closest to accurate measurements. I used a hard clear ruler to double check against my hands. Earlier I used a flexible ruler and didn't measure to the life line, but across the metacarpals. Ok. That last chart helps. I think I'm an F2. Is that good? mooky wrote: Ok. That last chart helps. I think I'm an F2. Is that good? Very nice to see that you were able to recognize that your codes belong to the FIRE hand shape category. tap wrote: I still I am not getting the middle area of the chart. Also is there no zone for earth/fire mix and air/water mix hand shape? ... I had hoped that the central 'mixed' zones would have made sense with the border line colors (without the names for those zones mentioned) - because there was not a lot of space. Anyway, now all zones are named inside the picture.